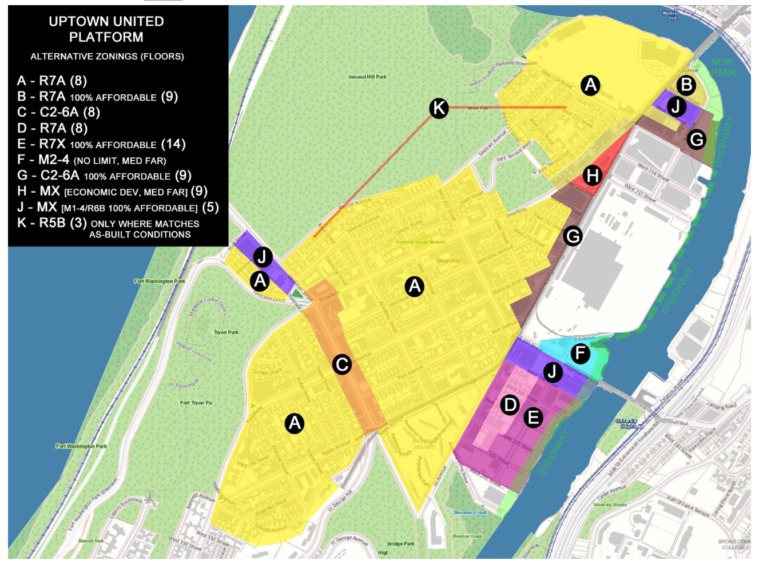 On Tuesday, a coalition of Inwood neighborhood groups and residents released the Uptown United Platform, a 16-page document that reacts to the Economic Development Corporation’s proposed rezoning of Inwood and proposes an alternative plan. These Inwood stakeholders join a number of other neighborhood coalitions who have reacted to the de Blasio administration’s proposed rezonings with their own plans and white papers over the past three years, including the Coalition for Community Advancement in Cypress Hills and East New York, the Bronx Coalition for a Community Vision, the steering committee of the East Harlem Neighborhood Plan and the Movement for Justice in El Barrio, among others. Like the plans before it, the Uptown United Platform describes a variety of initiatives related to several facets of community well-being, while also calling for more comprehensive protections for existing tenants and more affordable housing than can be guaranteed under the city’s new mandatory inclusionary housing policy. Given the de Blasio administration’s negotiation process in other neighborhoods, it’s likely the administration will take some of Uptown United’s recommendations to heart, but the administration will also likely disagree with one of the platform’s central demands: that the city require 100 percent affordable housing on any upzoned property. The administration has in the past stated that requiring private properties to provide 100 percent affordable housing would be likely ruled unconstitutional. The platform is the merged outcome of proposals by multiple Inwood groups, including Northern Manhattan Is Not For Sale, Inwood Preservation, Inwood Small Business Coalition, Save Inwood Library and other residents, each of which brought their own priorities to the table in the crafting of a merged plan. The single document arrives two days prior to Community Board 12’s public hearing on the city’s proposed Inwood rezoning. The platform includes its own detailed rezoning strategy. Generally, it would use zoning to preserve the neighborhood’s character in more areas west of 10th avenue without upzoning stretches of Dyckman, Broadway and West 207 as the city’s proposal would do. It also would encourage residential development east of 10th avenue at more modest densities than those proposed by the city, and with some areas zoned for industrial or mixed uses. The document also includes a series of recommendations related to preserving existing affordable housing, creating truly affordable and “community-controlled” new housing on community land trusts, protecting small businesses, strengthening neighborhood infrastructure and making the neighborhood climate resilient. The platform also calls for the city’s redevelopment of the Inwood library to undergo a separate ULURP process. A section on “Respecting the Community” asks for a better program to create good construction jobs for locals, efforts to memorialize Lenape and African burial grounds, and improved community engagement. The Economic Development Corporation (EDC)’s proposed rezoning of Inwood, and its accompanying, multi-agency neighborhood plan, is currently making its way through the seven-month Uniform Land Use Review Procedure (ULURP), the process through which a rezoning is approved or disproved. EDC says its plan is the outcome of two-and-a-half years of thorough community engagement involving over 2,500 residents and other stakeholders, and will further many neighborhood goals including creating jobs, allowing waterfront access and improving neighborhood infrastructure, increasing investments to protect the neighborhood’s existing tenants, increasing the overall housing supply and affordable housing supply, and more. The Uptown United Platform, to the contrary, argues EDC’s proposal is a “top-down plan, created prior to community input.” It points to a map in a document produced by a consultant for EDC in January 2016 (and obtained by the advocates via the Freedom of Information Act) to suggest that EDC had an idea of the general shape its final rezoning would take long before the final plan came out. But EDC rejects this interpretation, saying there was no fully pre-planned rezoning. “The City structures environmental review consultant contracts broadly, so that a range of options can be considered. This standard practice increases efficiency and reduces cost overruns, and never replaces community engagement, which ultimately defined the proposal the City proposed. 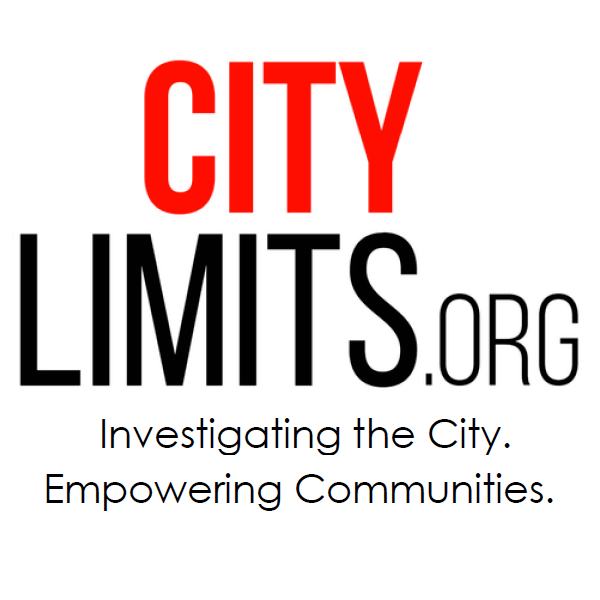 With several months left in the public review process, there is still time for the community to help us make this plan even better,” said Stephanie Baez, a spokesperson for EDC, in an e-mail to City Limits. You can read the alternative platform below, and express your own opinions at Community Board 12’s rezoning hearing on Thursday, February 22, 6:30 p.m. at I.S. 52, 650 Academy St.
EDC’s claims of community engagement shaping their plan are bogus, as the map we referred to with all the basic subdistricts of the ultimate plan proves. Their excuse is nonsense. They knew what they wanted, and they released it piece by piece and said each new piece was in response to the community or elected officials. The Jan 2016 map proves those were lies. Curiously, in the last release, a full 17 months after that map was made, they combined one popular change (adding a contextual zoning area, though it left out a vulnerable southern part of Inwood) with a very unpopular one (upzoning 3 major commercial corridors in a “Commercial U”) which no one in the community, NO ONE, asked for. The response in the packed community meeting where that plan was released was literally 100% against the Commercial U upzoning, as reported in CITY LIMITS. EDC never asked community groups why they opposed it, or tried to find a compromise. With no further engagement, they released the plan with all the same parts one month later and said that’s what’s going to EIS and ULURP. Yes, EDC has presented at many community board meetings and other sessions over two years, and counted up a lot of residents who attended. And through it all they totally disrespected the community and did just what they wanted. So armchair urban planners are arguing that Inwood deserves a customized re-zoning approach. Because they are special. I support the current proposal with its commercial “U.” I hope the city stands firm and shoves the current proposal through,. Hey Mr. Sterling, why do you assume there weren’t knowledgeable professional planners, architects, lawyers, environmental scientists, housing professionals, educators, public health professionals and more on the team, who have the added advantage of living in the area and knowing its needs far far better than a bureaucratic downtowners who are under political pressure? Just curious. Yes, they are ramming it through, exactly what we’re complaining about while they bleat on and on about “community input.” You sound like you work there. This is how the deBlasio administration is running the entire re-zoning process. Your community’s input means nothing to him. But where is your city council delegation in this fight? Don’t let the city force their plans on your neighborhood. Community people engaged for many months–some over two years–can hardly be called “armchair urban planners.” The experts among us (including a PhD AICP planner, 2 PhD environmental scientists, two engineers–one with development experience–and others) have spent countless hours doing research and writing comments making reasonable requests for added studies or different criteria in the environmental review process, only to be blown off by the City. We don’t want it to be our word against the City’s about issues such as displacement, so we requested studies or analyses which is our right to request in the EIS process. The City simply said NO, they don’t have to do it, just like they’ve blown off all community comments in the rezoning process itself that they don’t like. Yet there’s been at least one press release with the mayor calling Inwood NYC a “community-driven plan” when it is nothing of the sort. The real “armchair planners” are EDC’s planners who ignore research on the results of upzoning in lower income neighborhoods and who impose plans from 30,000 feet and ignore people’s lives and businesses on the ground. Of the many bad features of the City’s plan, the upzoned “Commercial U” is arguably the worst, putting most of our largely locally-owned, immigrant-owned, small businesses at risk of displacement as well as about 1,500 apartments. These shops are the heart of our local economy, keeping Inwood’s shopping money circulating in Inwood rather than going to chain stores’ Wall Street owners. The “Uptown United” plan has specific protections for our small businesses on these corridors such as store front length and area limitations which have worked well in other neighborhoods such as the Upper West Side. … ‘Armchair urban planners’ would refer to the ones who created the city planning efforts. The community plan was written by community members, meaning the opposite of armchair urban planners.. Parking in this neighborhood is really difficult. We need to provide for the influx of cars that will accompany more housing. If congestion pricing is approved there will be even more. You’re right, and enough new residents will own cars to make it an issue. But the deBlasio administration is generally opposed to minimum parking requirements in what they refer to as ‘transit zones’. Top-down plans are what happens when you disregard, as have the last several mayors, the expertise in the Department of City Planning and the Borough President’s planning office. It’s not a bad idea to have NYCEDC closely involved, but why are they driving the planning process to start with? Why have recent mayors seen DCP as a mere instrument for regulating the ULURP process? They actually do have qualified urban planners! Why has the community board not put forward its own full 197-a plan? If all they’re prepared to do is react, they’re going to be steamrollered. What is the position of the Borough President? This coverage leaves out a lot. This neighbor could use some changing. Needs new businesses that are not cell phone stores, nail salons, or restaurants that have hookah and DJs. Here’s a way to put the way-out-of-scale EDC rezoning plan in perspective. City Planning Dept data shows that City population is expected to grow by 3.3% by 2030. EDC’s own environmental review data says the rezoning would cause Inwood’s population to grow by 34% (~14,000 people) by 2032. That’s asking Inwood to absorb TEN TIMES Inwood’s share of the City’s population growth. But it’s worse than that. As we commented in the environmental review, the City’s “development scenario” for projecting growth and impact is way understated. We cited 8 specific criteria that are wrong and cause projected development to be understated. The City did not respond on the merits about a single criterion. So Inwood’s population growth by 2032 could easily be 50% to 70%. Outside our parkland, Inwood is quite small in area and in most parts quite dense. Asking us to absorb that much growth is crazy! But we are not a NIMBY group. We are not anti-growth. We know the City needs more housing and some can be built in Inwood. There are a few underdeveloped segments of Inwood that can grow significantly. The “Uptown United” alternative plan does include reasonably upzoning and ambitious growth in selected areas, as long as our ancient infrastructure is fixed first. In fact, the Uptown United plan projects Inwood population growth by 2032 at 22%. Quite robust, but reasonable; not the outrageous growth that EDC’s plan would portend. No one in city government is paying any attention to what effect such massive growth will have on the city’s aging infrastructure. What will all these new apartments do to the city’s water/sewer systems? Many of the water mains in Manhattan are over 100 years old. Many of water treatment facilities are close to 60 years old. Will upper Manhattan experience a dangerous drop in water pressure? What about electric and gas infrastructure? Note that EDC spokesperson Baez said that “community engagement … ultimately defined the proposal the City proposed.” That’s what they say in public. And in a press release last June, even the mayor called “Inwood NYC” a “community-driven” plan. But EDC knows better. In the environmental scoping phase, we commented that they “should strike all claims that the Inwood Rezoning Proposal is the result of collaboration with the community or a community-driven process, as these claims are patently false.” Their response was: “Comment noted. Neither the DSOW nor the FSOW reference a community-driven process.” But this admission is buried in a technical appendix (Final Scope of Work, Appendix 4, p. 17), while in public they keep saying they’re responsive to the community. The community knows better. Members of the Staten Island Housing Dignity Coalition say they still want answers to their critiques of the city’s rezoning proposal for Bay Street. In multiple Manhattan neighborhoods, groups say they want to limit tall buildings while alsodrequiring affordable housing. The De Blasio administration doesn’t always agree on the details. Community Board 12 has one month to deliberate the passionate views expressed on the Economic Development Corporation’s proposed neighborhood rezoning.